If you are looking for a unique way to steady your GoPro action camera whilst recording but also give you full control as you move. 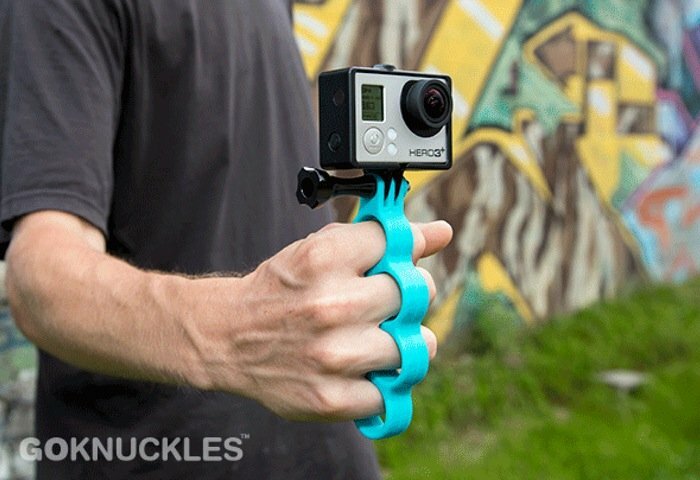 You might be interested in GoKnuckles a new action camera grip which has been specifically designed for the GoPro and inspired by the iconic Brass Knuckles. Created by GoWorx the GoKnuckles allow you to mount your action camera either way and is currently over on the Kickstarter crowd funding website looking to raise $4,500 in pledges to make the jump into production. It creators explain a little more about the grip and their inspiration behind the design : “If there is one thing GoPro fans around the world are demanding, it’s more fun. Thus we designed GoKnuckles, an incredibly functional handheld mount for your GoPro® HERO camera inspired by the iconic form of Brass Knuckles. Hit the streets, surf, and snow with GoKnuckles – the most awesome way to mount and use your GoPro HERO camera. Your GoPro camera can be mounted facing either way, which makes GoKnuckles the perfect tool for filming yourself and others during any action sports and adventures. So if you think is something you could benefit from, visit the Kickstarter website now to make a pledge and help become a reality.